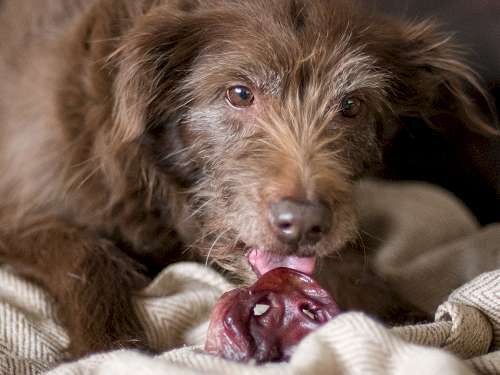 Dehydrated dog treat recipes - The only guide you need. 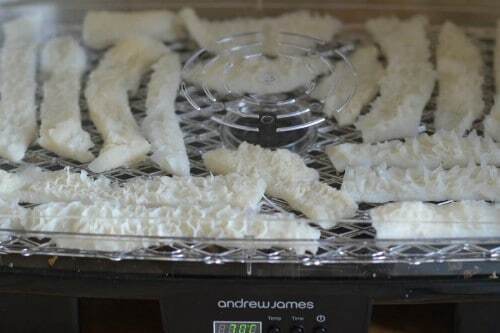 Dehydrators are cheap to buy and even cheaper to run! I’ve been wanting one for ages so I decided to just jump in and get one. I’ve been really impressed with this new toy and recommend any dog owner that enjoys baking homemade dog treats for their dog to buy one. Jerky treats are ideal for me as they are clean, dry and ideal for shoving in my pocket while out dog walking and dogs go crazy for it! 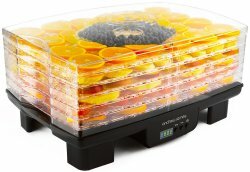 This is the dehydrator I’m using. It’s cheap and perfect for dog treats. Click pic to see it on Amazon. 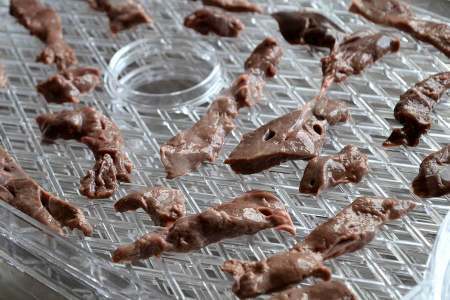 While researching how to make jerky for dogs I see that there’s recipes out there on the web that place raw meat including chicken on the dehydrator while on other websites they tell you to precook the meat first to kill pathogens. A dog becoming sick from such things as Salmonella is rare as their digestive tract is very small so bad bacteria usually gets killed before it can harm the dog. 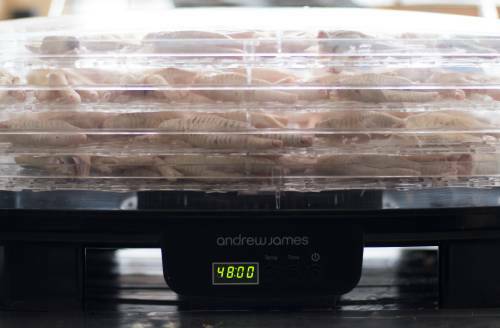 But note that the top temperature of a dehydrator is usually around 70c (160f) which is not enough to kill such pathogens as Salmonella and E. coli. 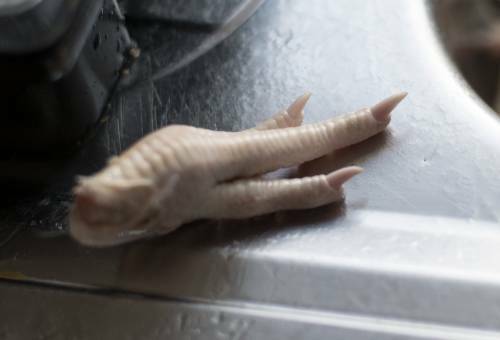 Therefore after drying raw meat I always put it in the oven for 10 minutes at 150ºC to make sure all pathogens are killed. 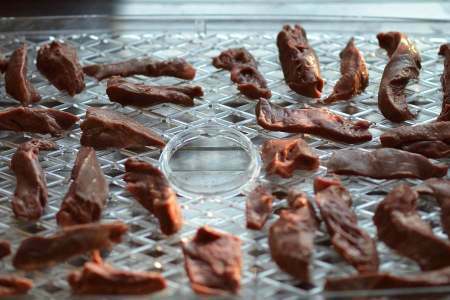 “Jerky can be considered “done” and safe to eat only when it has been heated sufficiently to destroy any pathogens present and is dry enough to be shelf-stable. 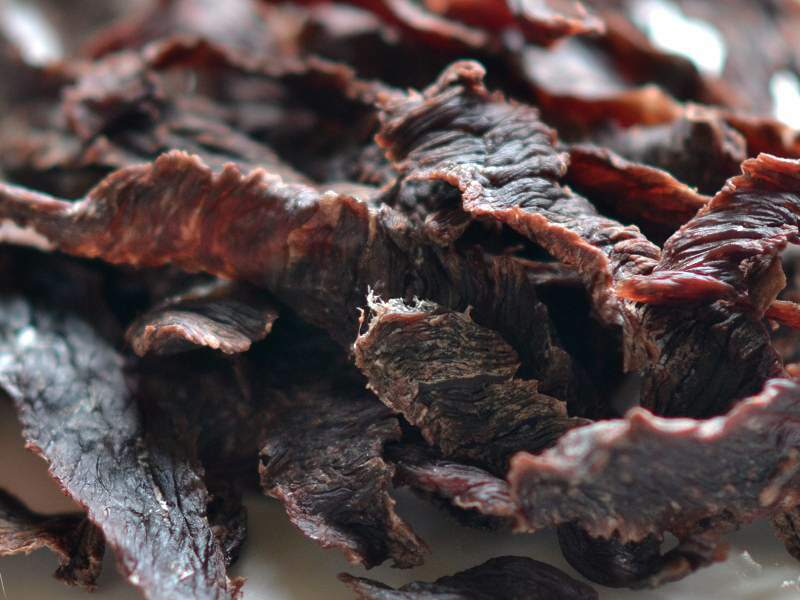 Shelf-stable means the the jerky can be stored at room temperature and will not support microbial growth. 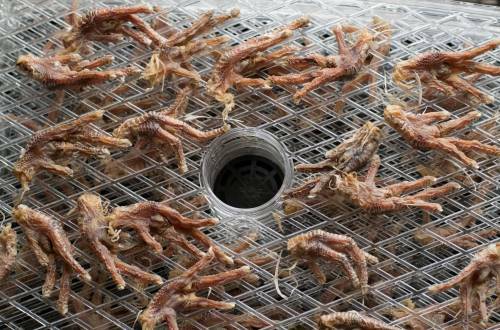 Oregon state University’s method for destroying pathogens: “Post-drying heating. 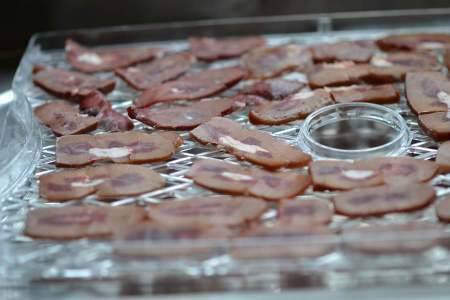 Placing dried meat strips on a cookie sheet in an oven preheated to 257ºF [126ºC] and heating the strips for 10 minutes effectively eliminates pathogens. 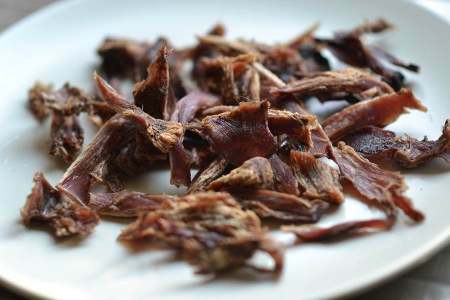 This method produces the most traditional jerky.” So after drying any raw meat I place the jerky in the oven for 10 minutes just to be sure. It doesn’t change the jerky in any way and gives me peace of mind. 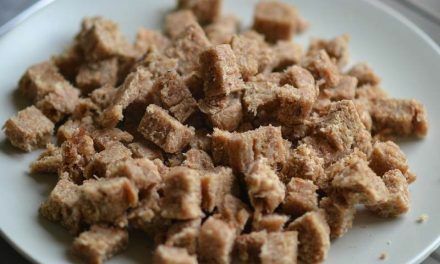 Many recipes (mainly for human consumption) use salt or vinegar soak to deal with pathogens in raw meat but both can cause stomach problems in dogs and I want to keep these treats pure and simple. Always wash your hands before you start. 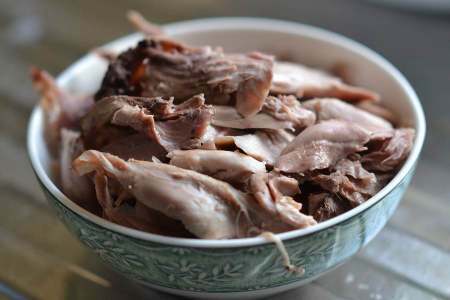 Food that has less fat lasts longer as fat can’t be dried and will spoil the food faster, so if you’re planning to store the treats for long term then trim any fat off the meat before you dry it out. Drying times vary a lot. Temperature, thickness’s of food, amount on trays and different machines all affect timing. Your user manual will help and you’ll soon get to know when it’s done by texture, look and from general experience. The above dehydrator is cheap and perfectly good and what I use but if you want the ‘Rolls-Royce’ of dehydrators check out Excalibur. 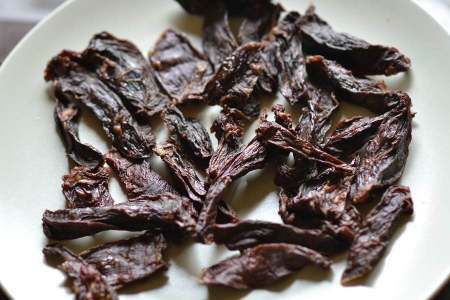 Place dehydrated jerky in the freezer (no defrost required) but you can learn more about storing jerky here. Cut meat as thin or as thick as you want but the thicker it is the longer it takes to dry. A very sharp knife makes life easier. You’ll be surprised how much food shrinks when dehydrated. 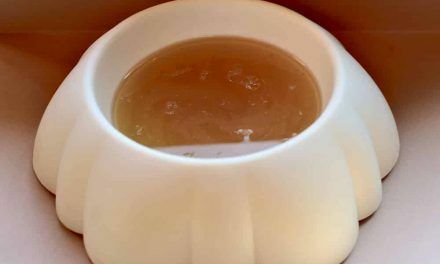 Just remember that it’s concentrated food and don’t give too much – it’s a treat! 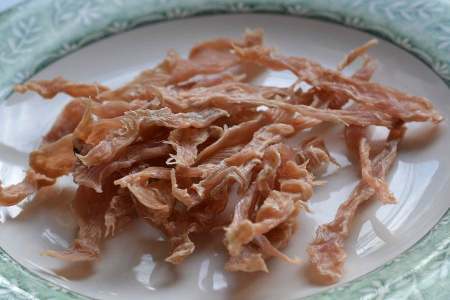 Dried pig ears are expensive to buy but if you can get raw pig ears then they can cost around a third of the price or less. Stick them on the dehydrator and once done you wont be able to tell them apart from the ones you buy in pet shops (except that they may be a lot larger!). They are easy to buy raw online if you have trouble getting them locally. All these pig ears cost just £5!! 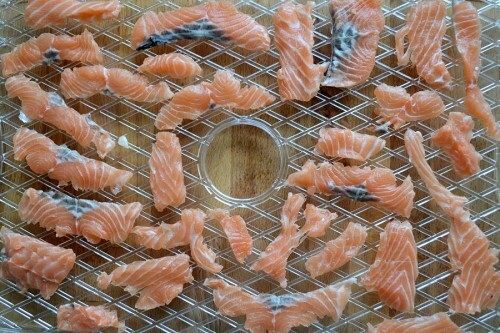 Place on dehydrator and dry for 16-24 hours. I filled 4 racks! 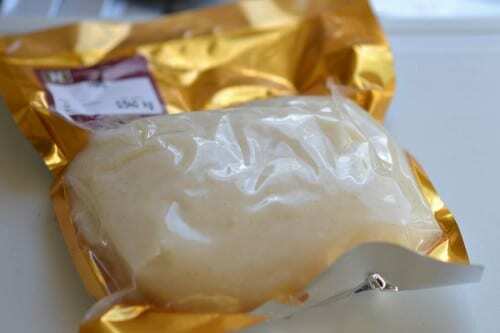 Once dried I place in oven at 257ºF (126ºC) for 10 mins. And they are done. Identical to what you buy in the shops. They have cost around 30p each. Great value! Flo just adores her homemade pig ears! 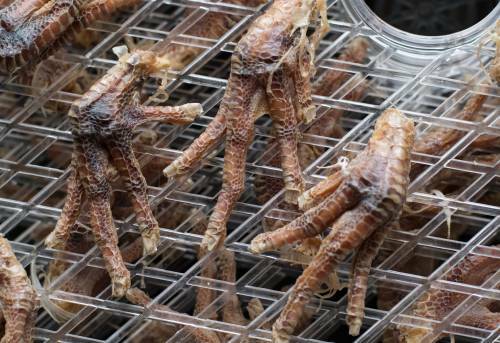 I first bought dried chicken feet in the pet shop 3 years ago for my new puppy Flo. It’s her all time favourite treat. If you ask a local butcher you may able to get raw feet for free else you can buy them raw and by the kilo on this website. 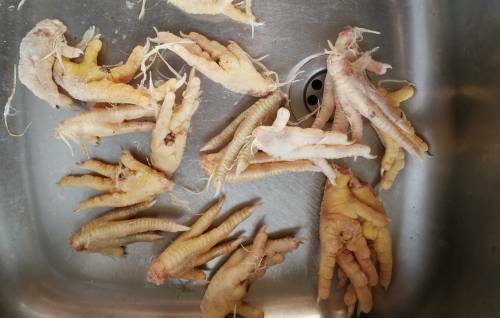 Raw chicken feet take ages to dry so there is no point just drying off a dozen or so. To make the drying time worthwhile I’m gonna be drying off 2 kilos worth of feet which will take around 4-5 days at 70ºC. The first thing I'll do is give the feet a wee rinse. So I chop them off! 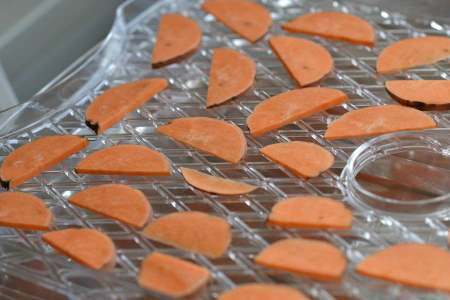 I'll be drying these for 96 - 120 hours, but the timer only goes up to 48 hours, so I'll be resetting the dehydrator 3 times. I'll know when they are done when there is no flex in the feet, especially the skin and the padded parts. I want them dry and hard. Nearly 120 hours later and they're done! No need to place in oven afterwards. They look great! I'm really happy with how this went! Really tasty and all the dogs loved them. Every super market sells pig skin it and it’s very cheap to buy. 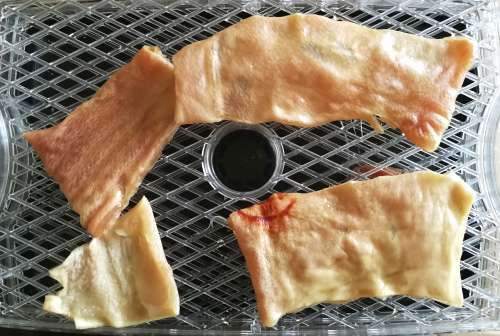 Dehydrating pig skin makes a great treat for dogs especially a treat to keep the dog busy – of all the foods here this one will last the longest. 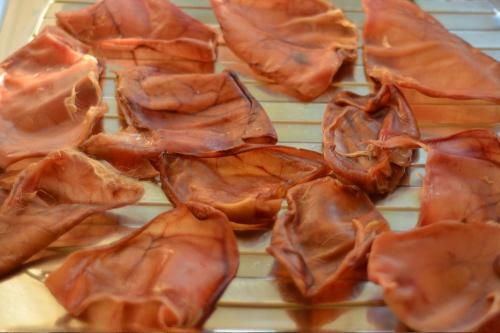 Pig skin dries a little different than pig ears and completely different than my doggy pork scratchings. It’s much harder to break down and isn’t as brittle as the ear, it’s more like rawhide and the dogs just go crazy for it. And like rawhide dogs should be supervised when eating it. 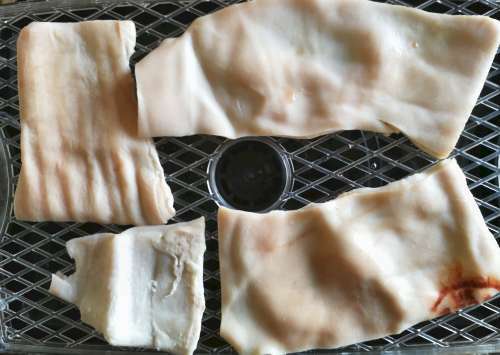 When prepping this recipe, cut the pig skin into the sizes you want before you dry as it’s too difficult to do it after – it’s very, very tough. Place the skin on the dehydrator. Remember to cut to the size you want before you dry. Dry at 70ºC for 24 hours. 24 hours later and it's dry and very tough. There may be a little grease on the inside so lay the dried skin on some kitchen towel to soak up any residue. One of Flo's favourite treats. This will keep her busy for a good 20 minutes. 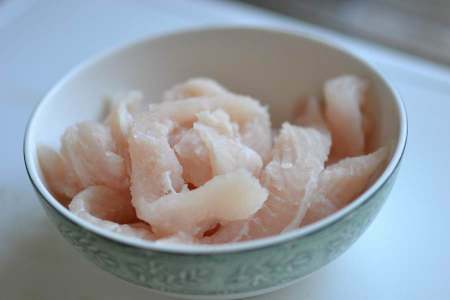 I’m using white tripe (dressed) cause it’s easier for me to get than green tripe (undressed) – although I do plan to try green tripe in the future. 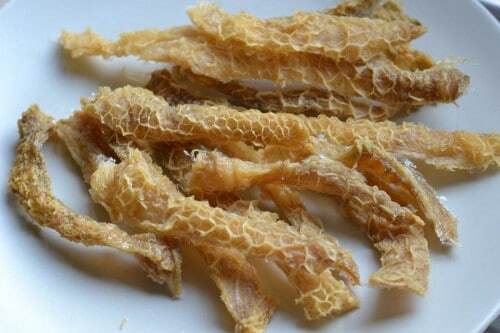 Green tripe is very smelly which is why dogs love it, so be warned when drying it indoors! 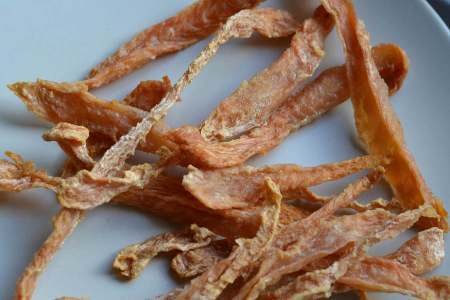 Every dog owner at one point has bought this treat in the pet shop, now you can have some fun by making tripe jerky at home. Half a kilo of white tripe I bought from the butchers. 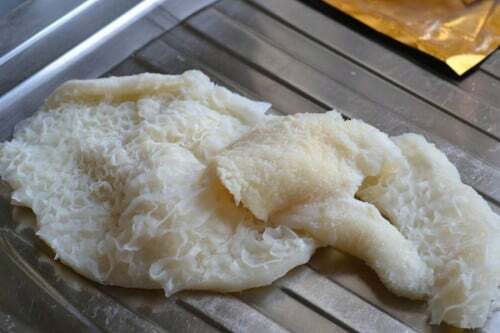 Wash tripe and then gently pat dry. Cut into 1 inch strips and place on tray. 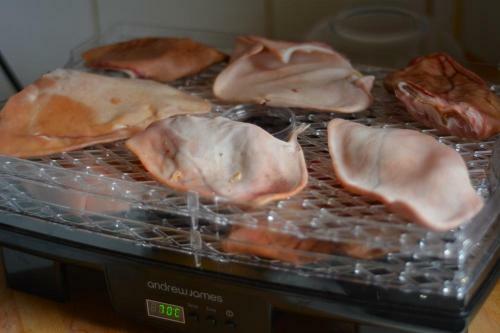 I'll be dehydrating for around 14 hours at 70ºC (158ºf) followed by a quick 10 minute heat in over . Tripe done! I'll bung it in the freezer for when I need it. 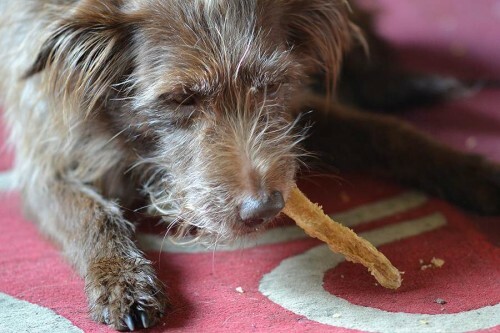 Ruby loves her homemade tripe jerky! 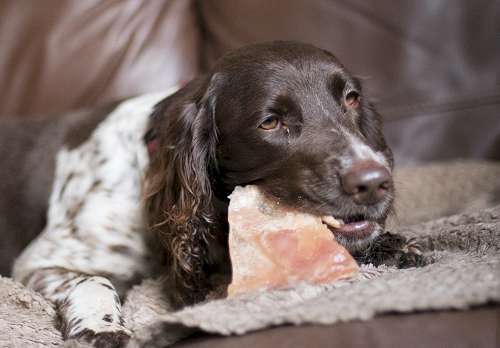 If you buy jerky for dogs it’s usually either chicken or beef. 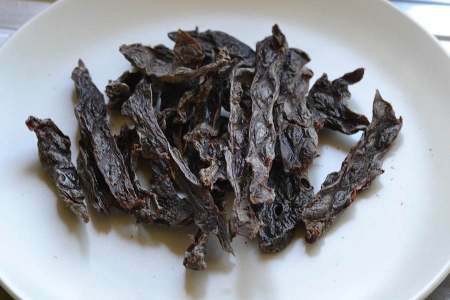 It’s rare to get in this pure high quality form, it’s usually very processed and nasty but here we can make a beef jerky treat worthy of our dogs. 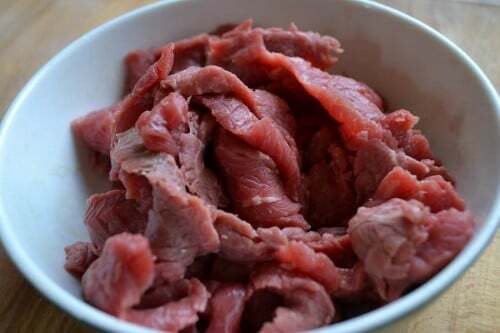 Freeze for an hour and then slice your lean beef 1/8th of an inch thick. 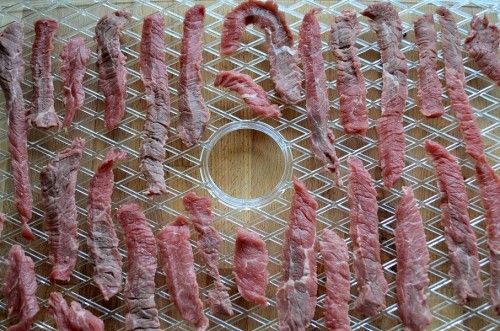 Evenly lay out beef strips on dehydrator tray and make sure no strips are touching each other. Check user instructions for cooking meat. For my dehydrator I'm advised to use the highest temp of 70ºc (158ºf). I will dry this batch for about 7-8 hours. I'll know it's ready if I bend it and it cracks without breaking. After 7-8 hours drying and 10 minutes in the oven they are done!. Freeze and reward dog when necessary. 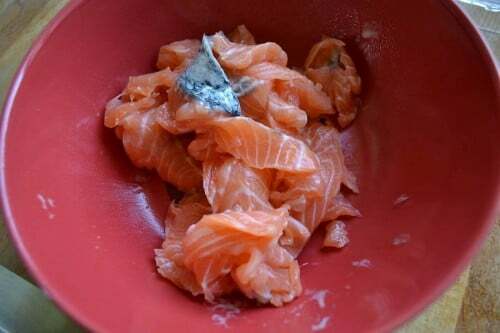 Freeze for 1 hour to firm salmon. Like the beef slice your salmon into strips about 1/8th of an inch thick. 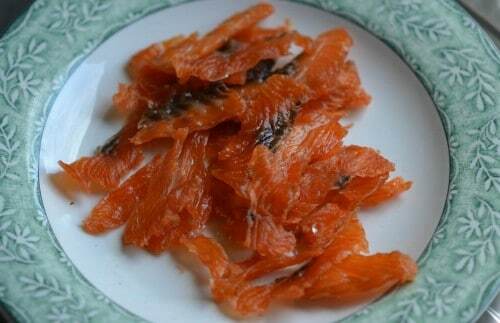 Place salmon on tray while making sure they are evenly spread and not touching. Check user guide for drying instructions. These will be dried at 70ºC (158ºf) for 8-10 hours or until they are hard and dry all the way through followed by 10 minute stint in the oven. 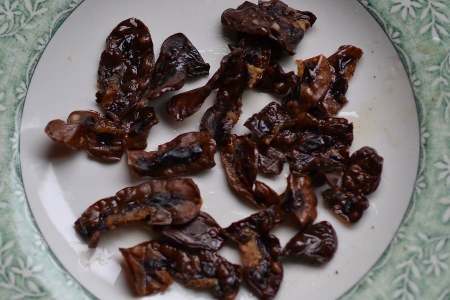 A great alternative to dried liver treats cooked in the oven. Hardly any smell and very clean to handle. You’ll want to cut thin strips of liver to reduce dehydrating time. 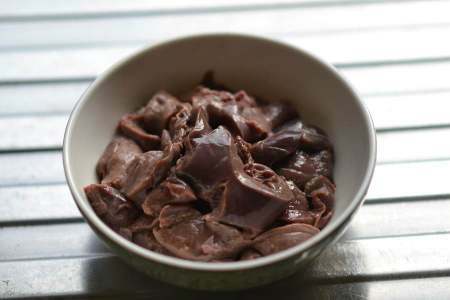 Liver is washed, patted dry and sliced in thin strips. Space evenly on tray. I will dry this for around 10-12 hours followed by a 10 minute stint in the oven! Liver jerky done! A real doggy favourite! Put in freezer for an hour to firm fish then slice into strips. 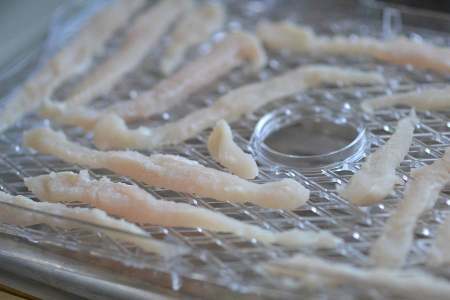 Place strips on tray and dehydrate. These took about 9 hours to dry then I put them in the oven for 10 mins. 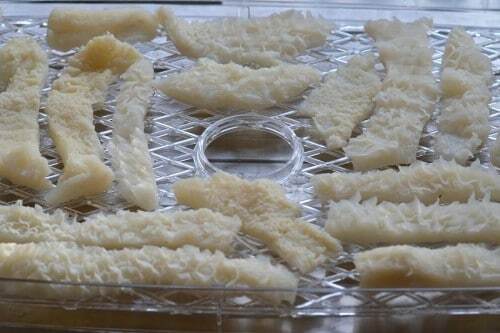 Sea bass fish jerky dog treats done! Delicious! I’m using a couple of chicken breasts for this recipe. I’ve trimmed off any bits of fat. 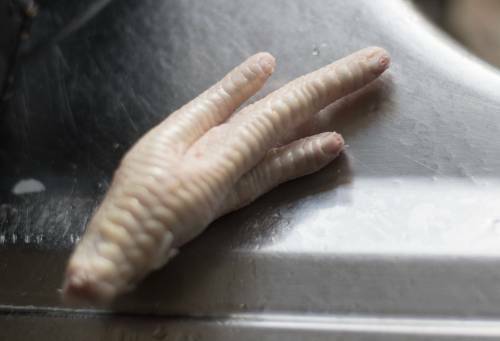 Wash hands, wash chicken, pat dry and cut thin strips. 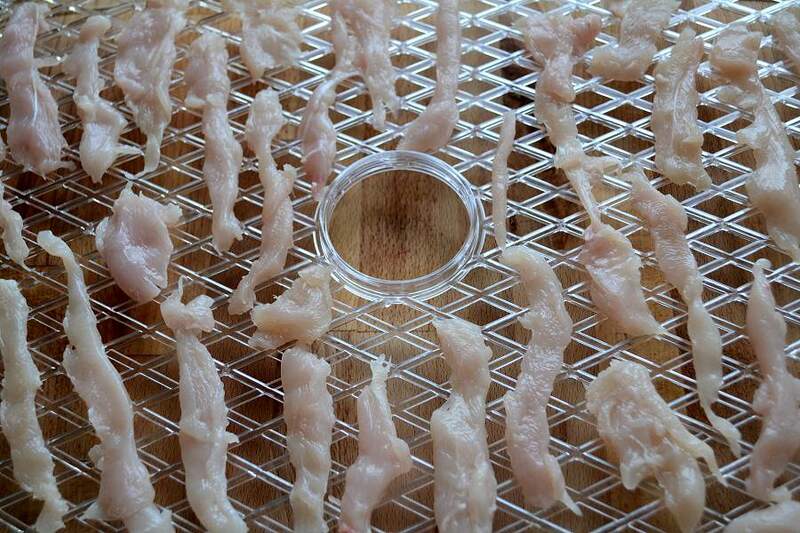 Place chicken strips evenly and without touching on dehydrator tray. 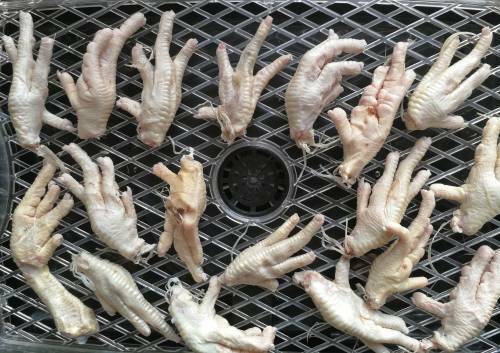 After around 8-10 hours they are dry and placed in the oven for 10 minutes at 150ºC (300ºf) to make sure it’s completely safe and free from any bacteria. Chicken jerky dog treats done! Place in freezer for when you need them. No defrost required. I bought a rabbit from the butchers but because it’s just so boney I’ll boil it first, take all the meat off the bone and then dry it. Lovely fresh rabbit! I'll bring it to the boil and then simmer for 2 hours. Once cooled I take all the meat of the bone! 6-8 hours in the dehydrator and it's done! 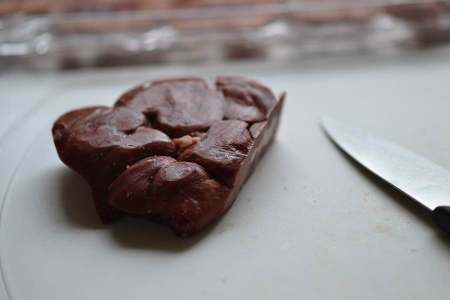 Heart is ideal for turning into jerky because it’s just pure muscle and apart from a little bit of fat on the outside it’s very lean. Because it is so lean and dense make sure that strips are cut thinly to reduce dehydrating time. 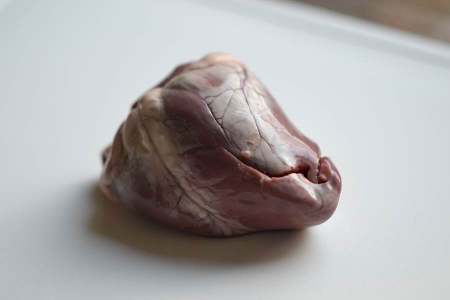 I bought a pack of Lamb hearts from the supermarket. Wash strips, trim fat, pat dry and place on tray. I'll be dehydrating these for around 12 hours. (Time varies on thickness of strips) followed by 10 mins in the oven. 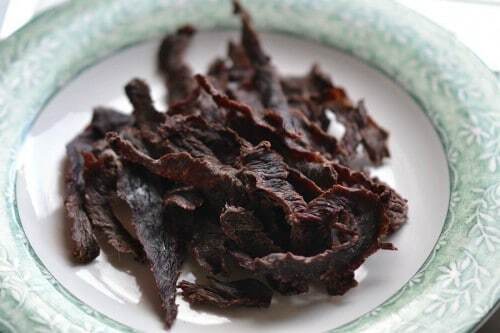 Using Ox kidney you can make great crisps with a real crunch. 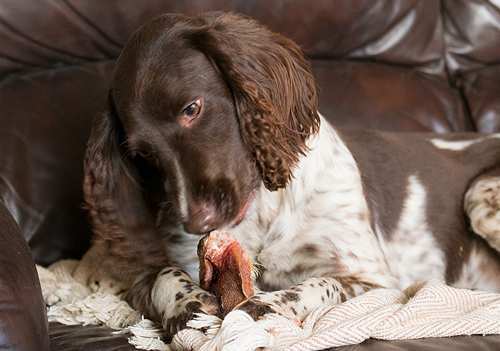 Cheap to buy and they smell like bacon – dogs love them! 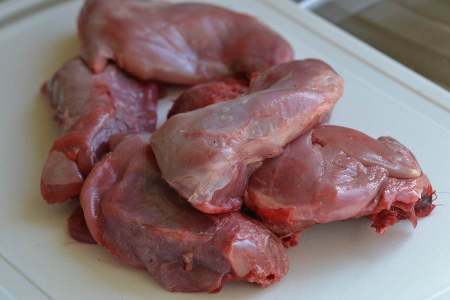 In Ox kidney there is a large bit of fat in the middle, cut that out if you plan to store. I freeze the kidney first so I can cut very thin slices. Place 'crisps' on tray. I'll dehydrate for 12 hours and then heat in oven for 10 mins afterwards. Kidney crisps done! A real winner with the dogs! Just for fun I bought a pig snout when ordering a delivery of fresh meat for the dogs. Very high value, the dogs go crazy for it. Lots of yummy meat. I dried it for 24 hours. 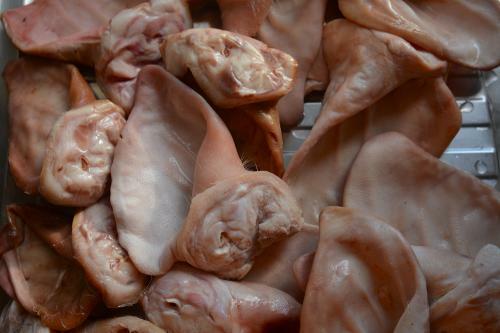 Huge success but drying pig snouts aren’t practical as they are not easy to get but fun and totally delicious. 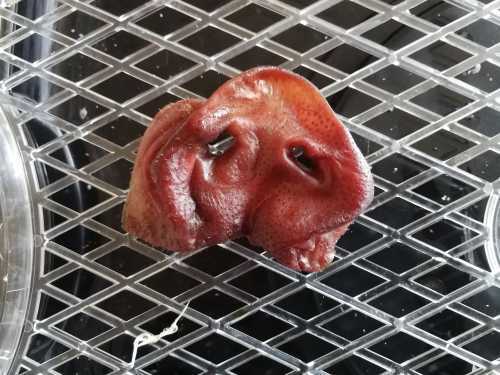 One pig snout placed on dehydrator. I'll let it dry for 24 hours at 70ºC. It's just pure delicious meat! 24 hours later and its hard and ready to give to dog. 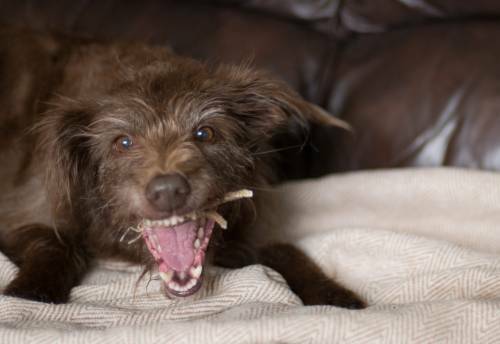 Ruby loves her dried pig snout! 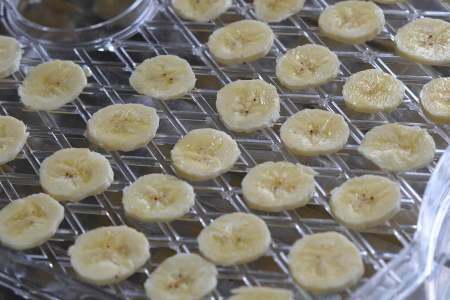 Dehydrators are also excellent for drying fruit and vegetables so things like bananas, apples and sweet potatoes can be dried to make dog treats. For me I prefer to use meat simply because my dog prefers it. 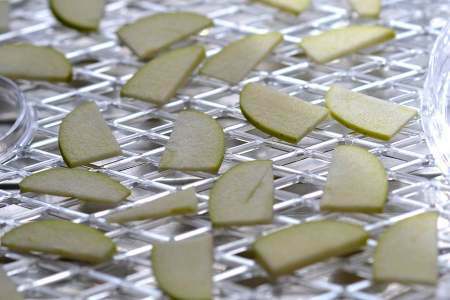 What about drying apple slices? 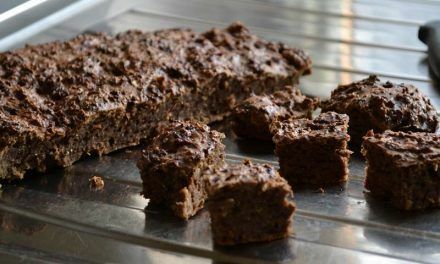 This is the first and original dog treat recipe using a dehydrator that was published on the internet and inspired many other websites to copy it, but they cut out all the important info. 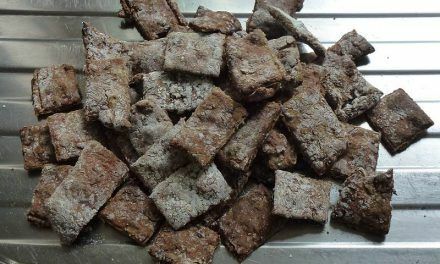 This is also the second most popular treat behind my liver cake recipe for dogs that I have on my site. What is the best way when storing these treats to allow them to remai fresh and give them a longer shelf life? I guess ultimately the freezer is the best place.